Ithaca Beer Company: IPAbbey (5 gallons/19 L, all-grain) OG = 1.072 FG = 1.008 IBU = 76 SRM = 9 ABV = 8.3% Ingredients 8 lbs. (3.6 kg) Pilsner malt 4 lbs. 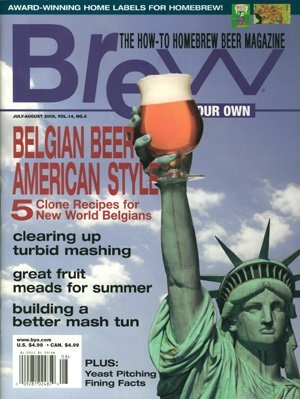 This beer has since been retired, but you can still brew up this Belgian blonde ale with this recipe. Feel free to allow fermentation temperature to rise if you would like the yeast to be more expressive. This Belgian-style blonde ale is light bodied and hop driven. It has a low level of yeast phenols and instead a lot of the spicy character comes from the aromatic hops. This is a traditional, Belgian-style wheat ale. Soft, hazy, and offering the characteristic Belgian phenols from the yeast along with the gentle taste of coriander and orange. by the numbers OG: 1.048­–1.054 (11.9–13.3 °P) FG: 1.010–1.014 (2.6–3.6 °P) SRM: 8–14 IBU: 20–30 ABV: 4.8–5.5% Mick, the bartender at the Monk’s Kettle in San Francisco, serves me a De Koninck. A low-ABV farmhouse beer style beer, meant for consumption after a long, hot day toiling in the fields. The turbid mash and unmalted grains help provide grainy character while the yeast is the main driver. Adding some a mild Brett yeast can be a fun twist. Brewers can substitute in flaked grains if berries are hard to come by. While originally brewed with a wit yeast, I thought a saison yeast might play nicely in the mix as well. The pepper hints from the Saaz and grains of paradise melded nicely while the orange provide a slight citrus character. If you’re looking for an experimental brewing technique, turbid mashing is a fun one to experiment with. This recipe provides outlines to brew up a low-ABV, Belgian-inspired, turbid-mashed beer. Get your stuykmanden ready!